Drobo is a series of multi-disk devices, which can be either DAS or NAS. In Drobo units, the BeyondRAID technology, which is not like any standard RAID level, is used. Due to the specifics and overall complexity of the technology, approaches to Drobo recovery significantly differ from the standard data recovery approaches. ReclaiMe Pro can reconstruct lost Drobo configurations over the disks coming from various Drobo devices like Drobo 5N, Drobo 5D, and Drobo FS. 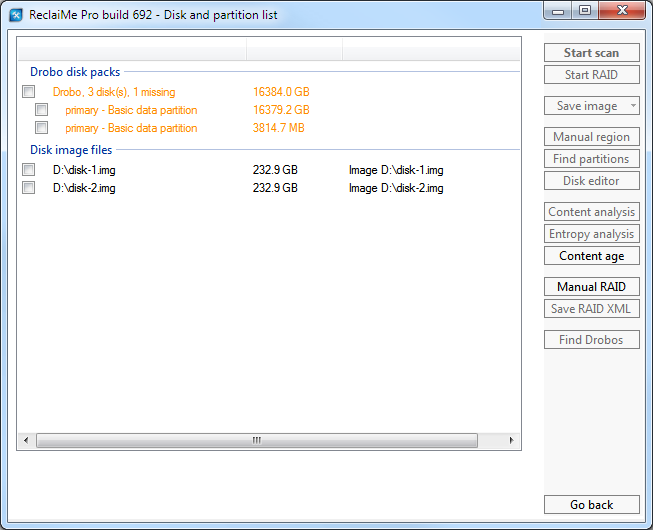 When starting, you can set ReclaiMe Pro up to look for Drobo metadata on the disks. However, only healthy or slightly damaged metadata sets can be recovered this way. Find Drobos mode is designed to reconstruct damaged Drobo configurations. The Find Drobos button becomes active when at least two disks are selected. 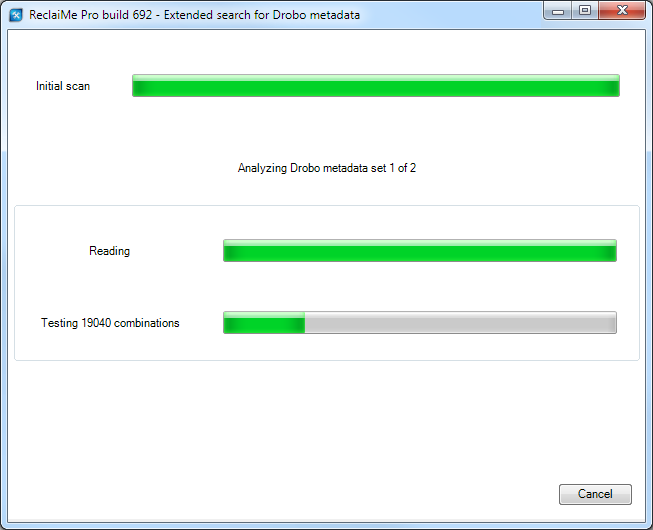 Once you click it, you see the Extended search for Drobo metadata window where you can follow the progress of Drobo recovery. During the initial scan, ReclaiMe Pro collects all the remnants of Drobo metadata on the disks you specified for analysis. Then the software tries to reconstruct Drobo configurations like disk order, Drobo chunk positions, and the like based on the found metadata. Once ReclaiMe Pro completes Drobo reconstruction process, it returns to the Disk and partition list window and places the reconstructed Drobo(s) under the Drobo disk packs group. This function requires at least two disks. Single-disk Drobo configurations cannot be recovered. The disk pack must contain at least 500GB of data for the analysis to be effective. Black - a healthy Drobo layout. Amber - Drobo layouts that have missing disks but can still be reconstructed by appropriate Drobo BeyondRAID redundancy (mirror or parity). Red - Drobo layouts which are not readable because too many disks missing. Due to the specifics of Drobo BeyondRAID, you can still try to recover data from such a layout; however, only partial recovery is possible.